I guess it is true to say that cottage garden plants, conjure up notions of escapism and a tad of romance. 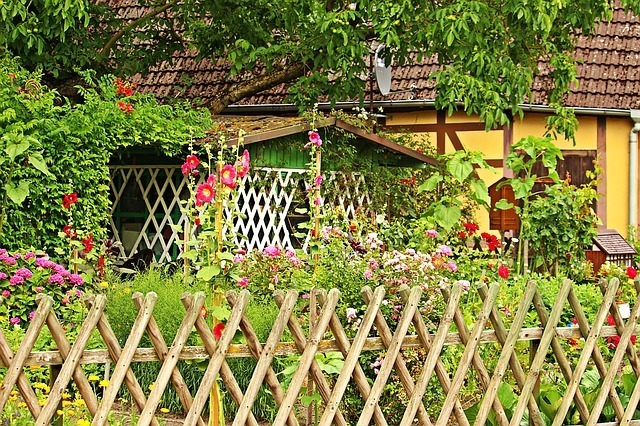 The idea of a cottage garden comes from those bygone days when working class families had to mix the pleasure of gardening with the practicality of having to make it pay for itself. In this article I will discuss, what I believe to be the best cottage plants, to grow in the shade and also in the sunny spots. This resulted in a strange mix of flowers, shrubs, vegetables, soft fruits, fruit trees along with different herbs and bulbs. The plants chosen, were highly fragrant to attract bees for honey making and soft fruits were grown freely between the plants. Many of the plants grown, such as southern-wood, were grown to take care of fleas, whereas yellow loose-strife plants were hung over doors to take care of flies. There was typically a practical use for every plant in the cottage garden. In more modern times the cottage garden has become much more ornamental than practical, with vegetables and fruits being replaced with herbs and flowers. This happened simply because gardening became much more of a recreational activity rather than a necessity of life. This is also when we noticed garden paths and fencing being introduced and this was usually done by using local products making cottage gardens different in each area. Like anything else in life a good looking cottage garden all comes down to design. When selecting cottage garden plants it is all about one thing really, combining texture and contrast. A very simple example of this is the simple leaf shape. Having different leaf shapes close to one another provide great contrast and add a great dimension to any garden. For me however, nothing beats colours in a garden but this is a very personal thing. I have yet to meet two gardeners who agree on the same choices of colours. I am a huge fan of the lighter pastel colours and tend to avoid the garish reds and oranges that so many other people like. As I said however it is always a matter of personal preference. Grow climbers on fences and walls. By following the above suggestions, you will get a nice traditional feel to your cottage garden. I will do these in alphabetical order to make things a little bit easier to follow. Here is my my favourite list of cottage garden plants. These are beautiful in the late summer and early Autumn and are perennials. (Please note the roots are poisonous so don't plant near vegetables) They have a hooded flower shape and are popular in two versions. Rosea - This is the more common species seen in forms such as Chater' Double or my own favorite Nigra with its wonderful chocolate/maroon colours. Double forms are usually found under the name Powder-Puff and are red, pink, white or yellow. Cottage Garden Plants Beginning with "A"
This is described as a good indicator plant for any would be cottage gardener. They have loose sprays of small yellow green flowers which appear in early summer above broad downy leaves. These self seed easily in the garden. These are tough perennials that produce magnificent displays of daisy like flowers in the late Summer and early Autumn. They grow quite tall but do not need to be staked. The plant has pink flowers and a white version is available known as Honorine Jobert. My own favourite is the pink coloured Queen Charlotte. This is a perrenial but I should warn you that it has a short life. It is used mostly as a bedding plant and has tubular flowers known sometimes as bunny rabbits. It comes in a wide range of mixed colour varieties and available in tall, medium or dwarf. The Yellow Monarch and the Purple King are ideal for a good cottage garden. These are very popular and are a dainty perennial with very distinct winged and spurred flowers. Granny's bonnets are most popular in the UK with red, violet, pink or white flowers in early summer. The Monarch hybrid is also very popular and Norma Barlow is a very good double version. My advice is definitely include this in your cottage garden. This is also a must for the cottage garden and is a perennial. There are many variations of these and I have to be honest and say they are prone to disease. They are nice plants and add great colour but I tend to settle for the lesser known species of these. 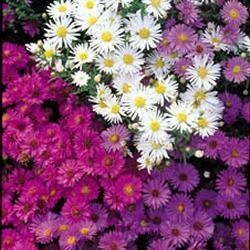 The Amellus has lovely violet and pink flowers and the Frikartii is my own personal favourite aster. The foilage is clean and the stems are strong and it has the best sky blue coloured flowers I have seen. Cottage Garden Plants Beginning with "B"
These are great shrubs and a great attraction for bees and butterflies as they have honey scented slower spikes around mid-summer. Davidii is the most common and Alternifolia with its lilac flowers is a great alternative. Cottage Garden Plants Beginning with "C"
These are some of the best flowers for a cottage garden. They come in many varieties and I use a lot of these. They come mainly in blue and white flowers and self seed. If you like the double variety then I would recommend the Fleur de Neige and the Pride of Exmouth. My own favourite is Bernice and it is more or less the only one that I use. ​These woody climbers are essential in any cottage type garden. Many of these are large flowered hybrids and many gardeners actually say you should not use Clematis in a cottage garden. I would actually disagree with that and if you use something like Flammula with its small creamy flowers has a wonderful scent and flowers in the Autumn. The Alpina with blue, white or red flowers are great for growing amongst deciduous shrubs. The Viticella is also a great alternative. These were my Mother's favourite and I know why. They are simply wonderful for the garden and are best described as miniature delights. They have broad lance shaped leaves with arching stems of pendant white bells which flower in April and May. They should be planted in a shady place and I would recommend planting them close to the house so as you can enjoy the amazing scent. A great perennial used in many wedding bouquets. Cottage Garden Plants Beginning with "D"
These are a very common perennial with what I would describe fashionable flowers. There are a ton of varieties and colours available. They can bring great colour to the garden and I plant quite a few of these. These grow tall and have annual and perennial flowers. You need to take care with these as some of the colours are a tad strange for a cottage garden especially if you have opted for a pastel look. I like the Astolat, Blue Fountains and New Century. This is a biennial which is self seeding. There are very good pale pink and white flowers. Grandiflora is smaller with a nice soft yellow flower. Cottage Garden Plants Beginning with "E"
This is a common bedding plant which is a perennial with very fragrant spring flowers in many colours except white and blue. Harpur Crewe is a nice double version. Wallflowers are short lived but worth having in your garden. The colours are great to have even though they don't flower for long. Cottage Garden Plants Beginning with "G"
This is a bulbous perennial with unique small white nodding flowers that bloom from January to March and have a delicate fragrance. Plant in a cool shaded position. These are mostly perennial and are very easy to grow and in my opinion are invaluable in any garden. They are great for covering the ground and produce long lasting flowers with deeply divided leaves. The meadow crane's bill has violet blue flowers, the Sanguineum has wonderful magenta coloured flowers and are also available in white and pink. This is a dainty perennial with pale yellow flowers and this plant actually has some medicinal uses. The Lady Stratheden has a warm yellow flower and would be my own particular choice. These produce billowing clouds of small mainly white flowers from June through to August and offer great contrast to the larger flowers. I plant these close to plants like the poppy for great and most impressive contrast. The Bristol Fairy and Rosy Veil are the most popular choices. Cottage Garden Plants Beginning with "H"
Another woody climber and one I think you will either love or hate. Personally I never use these as they are difficult to control and don't add great impact to the garden. The Glacier is the nicest with silver grey leaves and a white edge. A tough annual with large daisy flowers and as the name suggests they follow the sun. There are many interesting varieties and I like the Velvet Queen for its chocolate coloured flowers. Evergreen and flower in winter and spring and give great structure to the cottage garden. The Christmas Rose has white flowers and its black roots used to be dried and used as snuff many years ago. These are simple to grow and are summer flowering perennials whose funnel shaped bloom lasts only for one day. The overall display can however last up to two months. They come in red, maroon and pink and you can actually use the leaves in a salad. Cottage Garden Plants Beginning with "I"
These are hardy perennials and most are tall and have large flowers. There are also miniatures available for pot planting. The bearded irises are the most popular and they all flower in June and there are plenty of varieties in the market place. Cottage Garden Plants Beginning with "J"
A great woody climber which are grown for their flowers and have a great scent. It is best trained on a trellis or wall and flowers June to September. The best variety is affine. Cottage Garden Plants Beginning with "L"
These perennial climbers are in my opinion essential for the cottage garden and they can be trained on bean sticks or simply allowed to ramble over hedges and shrubs. They are also great for simply trailing on the ground. The flowers are rose and pink. The latafolius strain has magenta pink flowers and is my own preference. I would not create a cottage garden without having lavender in it. It is for me the best of the cottage garden plants. These woody shrubs are just great for your garden. They have profuse blue flowers and soft foilage and makes a great hedge. They also contrast well with ruby coloured roses or pinks. These bulbous perennials were loved by gardeners of old. They do require really good drainage. You also need to plant the bulbs deep at around 20 cm with plenty of coarse grit underneath. My own favourite is the white lily known as Lilium Candium. A favourite of mine and I love the purple yellow trumpet style flowers. The fragrance is best in the evening. There are four or five varieties available and in the main they come down to colour choice. These are biennial and flower in purple and white. Honesty is a self seeder and flowers in April. It is very popular in cottage gardens. A perennial that is easy to grow and the have erect spikes of pea flowers. The main species has blue flowers which appear in the summer. I like "My Castle" which have a red flower and Noble Maiden which have white and ivory flowers. Cottage Garden Plants Beginning with "M"
These are highly scented plants and come in four main groups. There is a ten week stock with double flowers. However, my own favourite is night scented stock which I sow in April and give great fragrance in the evening. Again a great choice for cottage garden plants that offer an amazing evening scent. The mint herb is great for the cottage garden and their aromatic leaves are often used in cooking. These grow fast and spread quickly so I tend to plant where they have a limited growth area. This is a small deciduous tree with a great rugged old world charm. They have large leaves with a bold texture and the fruits are delicious if you can beat the birds who love them. Cottage Garden Plants Beginning with "N"
This is a hardy annual with blue flowers that nestle among filigree foilage. Sow the seeds in Autumn or early spring but don't transplant. 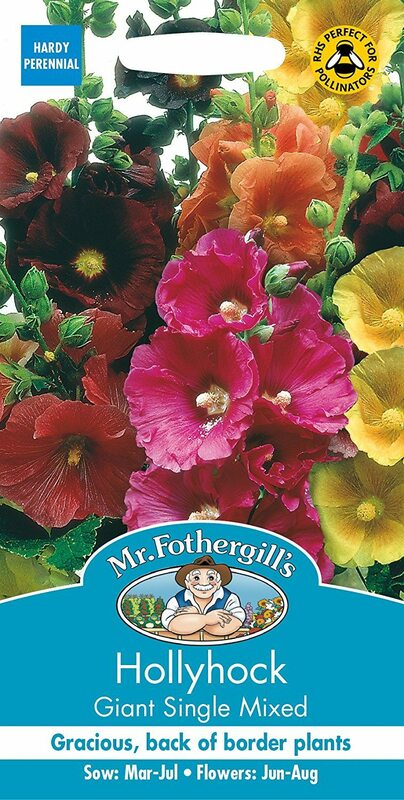 Cottage Garden Plants Beginning with "P"
This is a popular perennial with large bowl shaped flowers which range in colour from white through orange to deep red. I like Goliath and Cedric Morris. They flower from May to June. Cottage Garden Plants Beginning with "R"
Books have been written on roses so I will just recommend my own tastes here. I like the Hybrid Tea Roses and Christmas Roses. They do take work so I only have a few of these but they are also great looking in a garden. This is an evergreen aromatic shrub and they have greyish-green narrow leaves set against blue flowers which bloom in April and May. There are many varieties. Perfect for those who love their Pasta. Cottage Garden Plants Beginning with "S"
This is a well known dwarf semi-evergreen which is used as a herb. The grey leaves are very aromatic and the flowers are a blue purple colour. This is used as a low carpet in borders and is a perennial. It has sprays of pink flowers from May to July. This is a hardy deciduous shrub with highly scented flowers in May and June. Available in singles and doubles and a whole range of colours. Cottage Garden Plants Beginning with "T"
This is a well known evergreen herb with small leaves and purple flowers which are a great attraction for bees. There are many species and is great for growing in tubs. Cottage Garden Plants Beginning with "V"
The sweet scented violet has dark violet flowers and they appear in March and then again in the Summer. There are also pink and white forms and the doubles are called Parma Violets. I like the Viola Cornuta. These are deciduous woody climbers and the fruiting types are used for wine making. The majority can climb trees or used on a pergola and archways. I trust you have found this page on cottage Cottage Garden Plants" helpful and informative.